Earn up to 9,495 reward points. Exceptionally fine touch in an elegant digital piano. The CE220 boasts the AWA PROII wooden-key action, one that has been found on many award-winning Kawai instruments. This was the feature most often cited by owners of the CE200 as the reason for their purchase. With the CE220 Kawai has added to this popular feature several other upgrades and new features as well, including Kawai's Progressive Harmonic Imaging sound technology with 88-key piano sampling, which produces a more detailed, clear and realistic piano sound. It also comes with a convenient USB to Device capability. This allows you to record a song or practice session to a USB memory stick. The song can then be played on another instrument or loaded into a computer for printing a score or emailing to a friend or teacher. Another significant upgrade is 192-note polyphony, nearly 100 more than it's predecessor. Another sweet feature the CE220 has is both a Dual Mode, in which two sounds are played at the same time, and a Split mode, in which one sound plays on the left side of the keyboard and another sound plays on the right side. A special 4-Hands Mode creates two identical 44-note pianos on the keyboard - great for piano lessons or for duets. 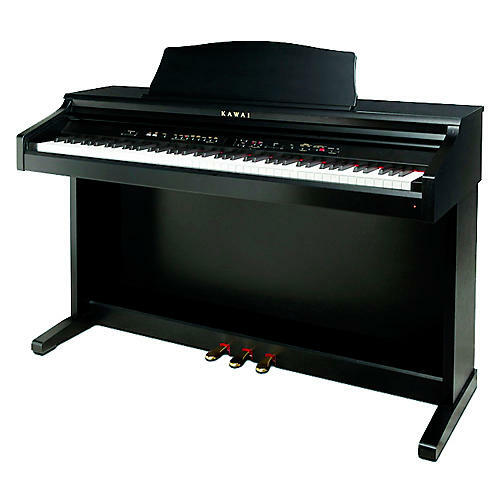 The CE220 has a convenient Balance Slider on the panel that controls the balance in a Dual or Splt Keyboard mode, two headphone jacks, a built-in metronome with a variety of time signatures, 100 built-in rhythms, 29 classic piano songs stored insides with an accompanying music book for learning, as well as a MIDI, Line In, Line Out jacks, and an extra USB jack. Finally, Kawai's designers gave the CE220 a beautiful premium satin black finish with matching bench, a sliding key cover, and three pedals which offer the same functionality as Kawai's world-class acoustic grand pianos. Get fine tone, touch, and value when you order the CE220 today! Dimensions: 54" x 20" x 35"